I really love all the Thai festivals and after our first initial shock of getting a bucket of water dumped on us, or been shot at with a water pistol from hundreds of youngsters on Beach Road that first year, we knew later how to celebrate it in style! Songkran is a long holiday to spend time being happy and excited with family and friends, respecting elders, going to the temple, playing with water, and eating seafood. The Songkran Festival in Thailand (traditional Thai New Years) is the biggest and most sought after holiday on the Thai calendar. Songkran is usually thought of as a few inebriated day of throwing buckets of water and shooting water guns where everyone is a target. It is traditional in temples all around the country to make merit by building sand pagodas. In Bangsaen the local people build both gigantic and beautiful sand pagodas. The Songkran Festival in Thailand is not all about water splashing and having fun. Thai people also take time out to visit their local temples to make merit and also to pour rose scented water over the hands of their elders. They do this in order to receive a blessing and good luck for the new year. Some families also go to their local temple to pray and make merit for dead ancestors. The ashes of these ancestors are often contained in miniature "chedis" which are like upturned hand bells. Once finished, all of the family members will light joss sticks and then squat down to say a short prayer. The pagoda is then sprayed with scented water. Paper banknotes are later given to the temple as part of the merit making. Traditionally, Thai people pour rose scented water over Buddha images and the hands of elders and monks. They do this in order to receive a blessing and also good luck for the new year. Thai people also go to the temple to make merit by offering food to the monks and taking part in activities such as "chedi sai" where they build stupas out of sand. The schools invites monks from a local temple so that the students and their parents could make merit. One of the main events organized during Songkran celebrations around Thailand is the Miss Songkran Beauty Contest. The contest is a good way to view the most beautiful women in Thailand. However, don't go expecting a traditional Western type competition. The Thai girls are all dressed up in traditional clothes of this region and you won't find a swimming costume category at all. The winner of the contest will take pride of place during the Songkran Parade held in several bigger towns or cities. 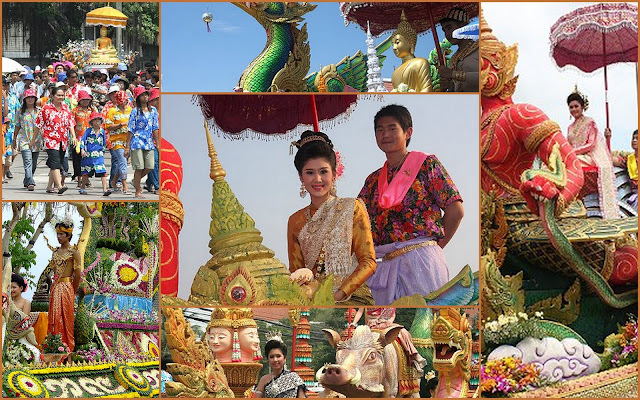 One of the best Songkran Parades in Thailand is held in Phra Pradaeng District in Samut Prakan Province. It is traditional for the Mon people in this region to release birds and fish during Songkran in order to make merit for themselves. Many of the townspeople dress up in their best clothes and then parade through the town to Wat Proteket Chettharam. One of the more traditional events that takes place during Songkran is "song nam phra". This is the practice of bathing Buddha images with rose scented water. Most tourists, and even some Thai teenagers, seem to think that Songkran is only about throwing water at each other. However, it was originally more a bathing of Buddha images and pouring water on the hands of monks and elders. The latter ceremony is called "rod nam dam hua". Over the years people tend to spend more time playing water fights which is obviously more fun. I got all this information from a website from Richard Barrow, he has extensive info on Thailand about all different kind of subjects, check it out! The only thing I am worried about for this years celebrations are the Red Shirts that are creating all this commotion and unrest in Bangkok! I believe there are already 17 dead people... I will find out some more info and write about that tomorrow! But seeing all these images makes me miss Thailand so much, I am so happy that in less than 8 weeks I will be there for 2 months!! Can't wait! Jasmine and Juliet are still too young to enter a beauty contest, but they would make a chance, no? What do you think? 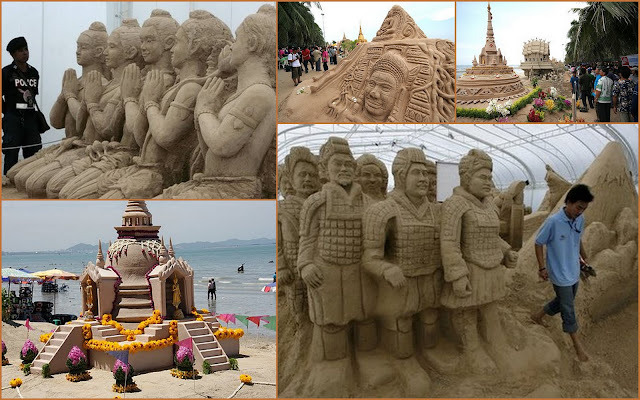 I love the idea of the sand pagodas! I definitely agree - your girls could be beauty contest winners! Why are you going to Thailand for 2 months? Holiday?? We're celebrating Songkran tonight in our house. First, we'll got out for Thai food and then we'll have some water fun back home...even if the temperature tonight is only supposed to be in the upper 40's! Yes Emm, I don't like to be here in SA when the World Cup is going on, the kids have 10 weeks off from school, so me and the girls are going 8 weeks to Koh Samui, and Dirk will follow us after the WC because he has 9 tickets!! So HE excited and ME excited! Oh, your girls go to the International school don;t they, so international holidays? That is great - I hope you all enjoy it there! I agree, those girls could definitely be winners! Love all the info on Songkran. Are you guys doing any watering throwing to celebrate?? I think they'd win, hands down! 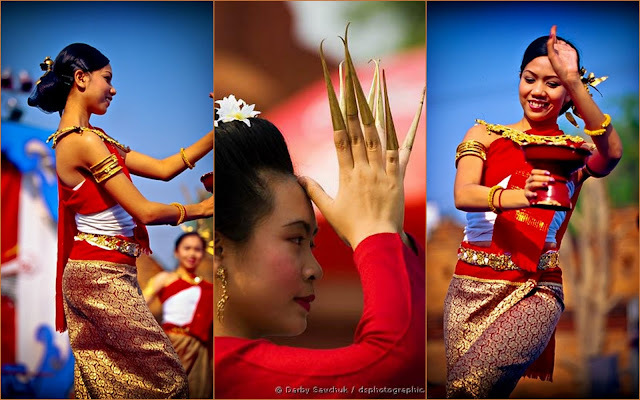 Beautiful photos and info on Thailand, too. Another great post! Wonderful posting, thanks Mireille! So good are the pics. You girls definitely will have a chance in a contest, yes!!! They would be the winners in my opinion! They look beautiful in the traditional dress. Looks like it is a great time! I would love to see all the sights of Thailand!